We offer the best of both -- and we’ll help you assess which technology is best suited for your job and your situation. Whether you’re a seasoned designer with a complex print job and a tight deadline or a little league coach with nothing more than a good idea, you’ll be glad to have our talented and experienced staff to work with. They will make sure your job looks its best. And if you need help making your vision a reality you can call on their services to help you create a product you'll be proud of. The following information and suggested guidelines should help you get your project off to a good start, and ensure that we can complete your job in the most efficient manner. King International uses Apple Macintosh computers and we accept files supported by the following applications. Edit and/or manipulate files $50.00/hr. - Please provide a printed color proof and/or a PDF of each file for our reference. 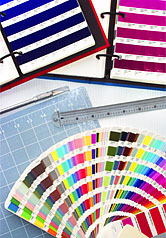 - On color-critical projects, provide an accurate printed proof so that we can match color. Optionally, we can output a color proof for your approval at an additional charge. - Please remove any extraneous artwork and/or pages that are not to be printed from the file you provide to us. - Keep all artwork within the borders set by the file’s document size. - Save a copy of your file, convert all fonts in the file to paths and provide that file to us for output. As an alternative, you can include all fonts, both printer and screen, used in the creation of your file. - Include all placed/linked images used in the document. - Set all text in a vector-based program (like Freehand or Illustrator) to ensure that the type prints as sharp as possible. - PC users should export files as either Adobe Illustrator or PDF file formats. - Artwork files submitted by mail should be sent on either CD-ROM or DVD-ROM. Ready to upload your files? You'll need to get in touch with your KIC sales rep to obtain a username and password. Before submitting your files, be sure you give each file a unique, clearly identifiable name (e.g. you might include your name, company name and/or the job name in the filename). We recommend that you use a data compression program, such as StuffIt (Mac) or WinZip (PC) to speed the uploading process and minimize the likelihood of data corruption during transfer. Click the "Submit" button below to open the file upload window. (If a new window doesn't open, you may need to set your browser to allow pop-up windows from www.ki-corp.com.) In the upload window click the first "Browse" or "Choose file" button, then navigate to your file. You can select up to three files to upload at a time. When you're ready, click on the "Upload" button. A status bar will show your file transfer progress.